Casting a light on inspirational figures of the last few centuries while providing opportunities for local involvement, is Bristol-based Redcliffe Film Productions. 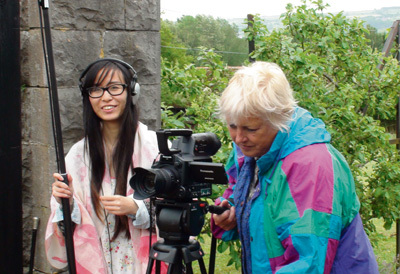 Set up three years ago by two sisters, Diana Taylor and Anthea Page, alongside friend Chris Worthington, Redcliffe Films has had productions featured at a variety of renowned film festivals across Europe including Barcelona, Berlin and London, and at most major venues throughout Bristol. Since the company’s inception, the team has produced full-length feature films that have told the life stories of influential people. Diana’s interest in Bristol’s history inspired her when she moved to the city. With a passion for history, music and poetry, Redcliffe Film’s three major subjects over the past few years have included Gloucester-born poet and composer Ivor Gurney, Bristol philanthropist Hannah More and West Country composer George Lloyd. The company's most recent film, on Lloyd, received help from the George Lloyd Society and additional assistance from two local students from the University of the West of England, Chris Chisman and Saul Hill. Strange Storms and Symphonies is a compilation of 100 pictures and film footage which reflect Lloyd’s life against a soundtrack of his compositions and audio clippings from him and his wife. Growing up in St Ives, he also served in World War II, during which time he composed the Trinidad March, which is being played at the last night of the Proms. “His story is such an inspiration,” says Diana. Strange Storms and Symphonies will be shown across various venues in Cornwall by the George Lloyd Society, tying in nicely with his centenary, and is expected to be shown in Bristol early next year. The film Hannah More called on local volunteers and actors to transport the viewer back to More’s active life in Bristol, alongside the archaic set design and period costumes. It reveals the story of the playwright’s life throughout the turbulent era of the late 18th and early 19th century; a time in which England was heavily involved in the slave trade, and at the centre of much political unrest. “We are all about making films out of our own creativity, on as little money as possible,” explains Diana. Diana and Anthea – both directors of Redcliffe Film Productions – began their journeys at the BBC. Diana started out as an assistant film editor at the BBC in London around 25 years ago, where she progressed to film editor in news and current affairs and documentary features, and became an assistant producer in continuing education programmes. Anthea – a script writer – was a set designer and art director at the national broadcasting company. On September 12, Diana will be holding an event at Halo on Gloucester Road. “Arrows of Desire Poetry 4 Today” will see the likes of David C Johnson, Tim Borrows, Trevor Carter, Charles Thompson, Martin Riser and Tim Vosva joining together in an evening of performance poetry, political films and acoustic music. To learn more about Redcliffe Films visit www.redcliffefilms.co.uk or to see more of Diana’s work, check out her YouTube channel www.youtube.com/user/taylor9ization.